(Phys.org)—A pair of researchers at the Indian Institute of Science Education and Research Kolkata has found that an easily synthesized compound can be used to remove fluoride and metal ions from drinking water. In their paper published in the journal ACS Omega, Tanmay Das and Debasish Haldar describe how the compound was synthesized and how well it performed under various testing regimens. Called Zwitterionic spirocyclic Meisenheimer complex 1, the compound was synthesized from picric acid and N,N′-dicyclohexylcarbodiimide. The result, the researchers claim, is a compound that can be used to remove a host of pollutants from drinking water. As the researchers note, drinking water is a key resource as the world's population increases. In addition to the water needed to quench the thirst of billions of people, water is used in agriculture to feed all those people and to create products for them to use. As they further note, pulling water from underground reservoirs to water crops leads to an increase in fluoride and arsenic in the water that is pulled up for drinking. In addition, a host of modern manufacturing processes release a wide variety of metals into streams and other water supplies. Dad and Haldar note that many methods have been developed to remove toxins in water, but they are single-purpose remedies. The researchers seek a universal compound that can remove most of the materials in one fell swoop—compound 1, they claim, appears to be that solution. After synthesizing the compound, which repels water, the researchers tested its ability to clean drinking water. They added a host of metal ions to a glass of water and then poured it through a gel containing their compound. They report that the absorption capacity was approximately 99 percent. Testing revealed that the compound was successful at removing large amounts of lead, mercury, copper, iron and fluoride—reducing most to levels below World Health Organization standards. Furthermore, they found a sponge containing the compound could be used to remove oils from water, suggesting it could also be used to clean oil spills. The recycle, cleaning, and reuse of water are highly important for environmental remediation. This issue is addressed by creating a fluorescent zwitterionic spirocyclic Meisenheimer complex with high chelating propensity for toxic metals using low-cost starting materials and a one-pot synthesis technique. The resulting material is able to detect fluoride up to 12.8 ppb level and remove 82% aqueous fluoride from 1000 mL of 100 ppm fluoride solution in a single contact. The material demonstrates rapid kinetics and is capable of dropping the toxic metal ion (Pb/Hg/Cd) concentration below 0.2 ppb within 10 min. 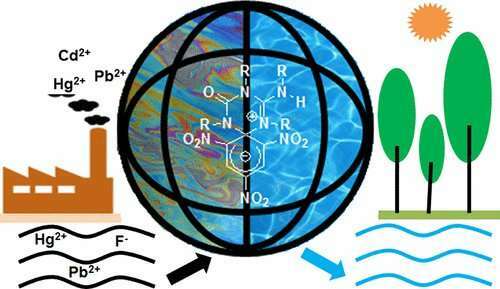 A resin-free, precipitation-free, and reusable technique has been developed for the removal of toxic metal ions and fluoride from extremely polluted water. Moreover, utilizing its extreme hydrophobicity, polystyrene sponges have been coated with the Meisenheimer complex to mop up oil spill and organic solvents from a biphasic mixture.